I have to start by saying that I'm So, So, So glad I took a deep breath and un-finished this quilt. There were a number of other solutions that came to mind, but giving the quilt a fresh and thorough quilting treatment was really what it needed. Ta da! Here's my Cascade quilt, take two. What do you think? Here's the old version. Oh, sad. Yes, that was so little quilting that it only took about 3 hours to remove it! Not such a bad way to spend some time in front of the telly. For the new quilting, I selected a design called Pine Needles. There was really no other option once I realized how perfectly this design would accommodate the shifting channels of this quilt. No matter how the colors shift and fall, Pine Needles creates an arrow shape centered over the channel. I love it! 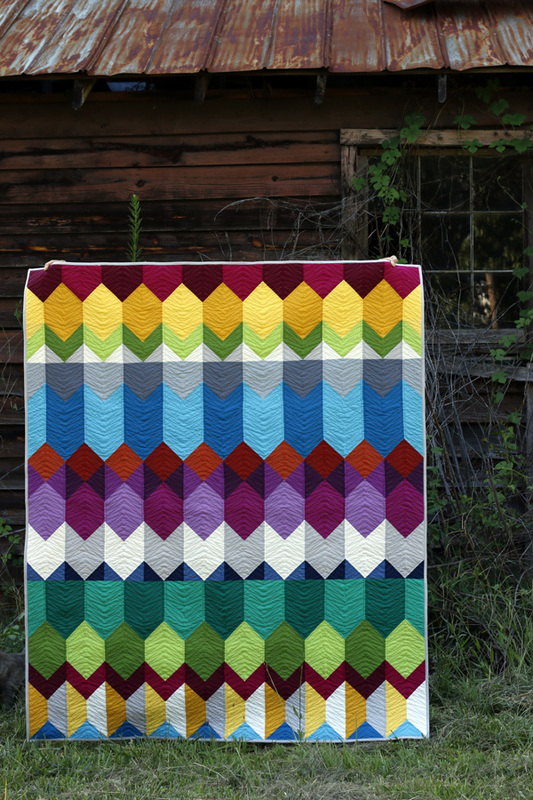 I created a new backing for the quilt, piecing together Carolyn Friedlander and Art Gallery fabrics that feel as cheery and modern as the quilt top. I was able to reuse the same binding. Yay! Now that I've reformed Cascade, it's ready to become part of someone's cozy home. You'll find Cascade listed today in my Handmades shop. Or, want to make your own? 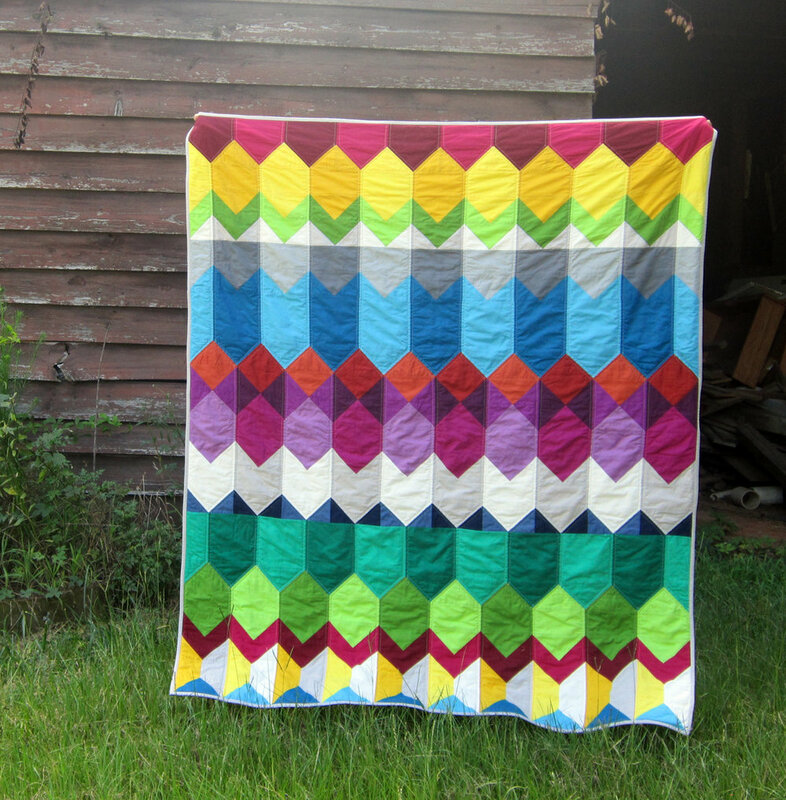 Cascade is also available as a quilt pattern. Specific Kona colors are listed, so you may duplicate the quilt if desired. There's also a color sheet printable, to help you plan your own version. The pattern is suitable for a confident beginner or intermediate quilter. A detailed Flying Geese Skills Lab will walk you through correct piecing techniques for this classic block. This year I am updating my older patterns. My new pattern format is more compact and attractive, plus often more brief. I'm on the fence about updating Cascade pattern or just phasing it out. It hasn't been one of my more popular patterns. Maybe because of the poor quilting on my sample quilt? Could be. Anyhoo, if you've had your eye on this pattern, now is the time to get it. If I do update Cascade pattern later this year, you will be eligible for a free copy of the new version, so no risk there.